During the final days of summer I have ventured out of the corner that had become my painting haven into the open to figure if it’s possible to have some miniature time with the family. It seems it is possible at least to assemble miniatures, less so for precision painting due to changing conditions of light. I guess now I can bring out the Project Box to wherever I move – especially when I fancy building a new kit. With this adventure I fully assembled the Khorne Bloodcrushers, ready for basing and priming. No disruptive winds, great view and fresh air. Perfect. Though the inhabitants are a bit too curious for my taste. Either wants to assist with some mould lines or looks for Daemons to devour. Next up I had a pretty swell birthday weekend where the stars aligned and my actual birthday landed on a Saturday! Good times with friends, coworkers and family brought mostly clothing (comes with the age it seems), lots and lots of CAKE and more importantly, miniatures! I’m planning an unboxing for one of the minis I got, let’s hope I get it done. … and then even more! It was cake-tastic. Some loot I got. I guess the significance to me is obvious! My first WH40k meme tshirt! More for the Horus Heresy collection! Teasers as to the contents coming up! I also had a visit to Belgium for mostly work (or so I first thought) where I got to visit Brussels and Bruges in a span of three days. What I expected to be another routine sales meeting turned into an actual summer event with an actual treasure hunt activity in Bruges. Though it puzzles me how an event in October especially in Europe can be designated as a “summer event” I had a tremendous time with co-workers on the hunt to best ridiculous challenges such as acting out the scene of a painting, pretending to be a survivor of the Apocalypse and reading out poems no less! The European Parliament. Very imposing. Not so gigantic on the inside though. First day in Bruges, rushing to the hotel to change. The treasure hunt begins! We’re on our way to the first challenge. The Wu Wei Er Wei! Team Awesome, having a little break! I’ll try to make time for Bruges a second time to savor everything without running around. I had to visit a chocolatier in Belgium! The municipal building at the town square. Papageno from Mozart’s Die Zauberflöte. On our way back from Bruges we stopped by Chez Leon where I had mussels for the first time in my life! I can hear you asking “but what about the miniatures?”. Well apart from the Bloodcrushers I started carefully basecoating the Mhara Gal Dreadnought with the reds but since it’s not really exciting I do not have photos of the mini itself. So far I feel like there will be a challenge for the parts where armor fuses with the daemon possessing the Dreadnought, I’ll try to portray my struggle as best I can. I will however leave this teaser for Friday – I started cleaning the miniatures in the two gift packs. Can you tell who will be first to be reviewed? Hint: Some casualties are Iron Hands marines. Belgium looks amazing, I’m hoping to go there soon! Glad you had an awesome birthday sir, anyway! 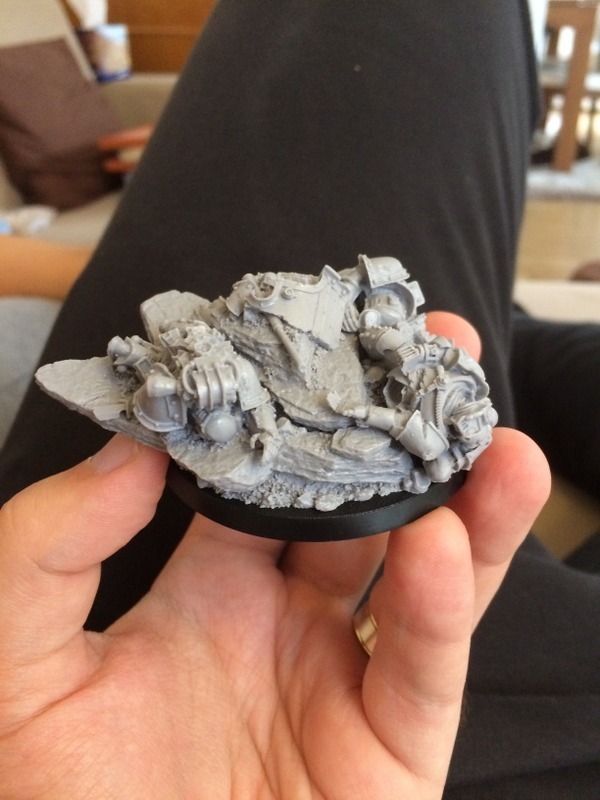 Looking forward to seeing what that base is all about – who doesn’t love a good scenic base, after all! Wonderful photos, and happy birthday! Thanks Greg! Check this place out tomorrow, I’ve got a surprise brewing. And hey, congrats to YOU too! That photo of your workplace looks so classy. I must strive to achieve a similar look ;). Looks good while it lasts! Then I scrape some mouldlines and it becomes a mess!